Through the donation of scrapbooking and crafting materials and tools, Chicago scrapbookers and Creating Keepsakes give back to the community. We always love coming out to loyal cities like Chicago, and this year we are particularly excited to be able to leave a little something behind for the community. For the 2nd year, on October 4th & 5th, scrapbooking enthusiasts from Chicago and the surrounding areas will come together for a weekend of creating, learning, socializing, shopping, and more. And while to the outside observer it may simply look like a bunch of people working on craft projects and shopping, to many children and families in the Chicago area, it means much more. 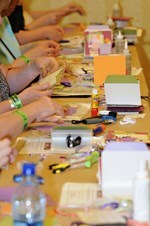 This is the 2nd year Creating Keepsakes has hosted a Scrapbooking Convention in Chicago, and each show has proven to be better than the last. There are two main components of the event, classes and the Vendor Faire. Attendees can sign up for classes taught by industry experts and actually learn the tricks and techniques used by the professionals. The Vendor Faire provides attendees the opportunity to shop for the latest trends and products from leading manufacturers. Brooke continued, “We always love coming out to loyal cities like Chicago, and this year we are particularly excited to be able to leave a little something behind for the community.” While class seats are still available for CKC-Chicago, seats are expected to completely fill; for more detailed information or to buy discounted preregistration tickets, please visit CKScrapbookEvents.com/Chicago.